Photograph courtesy of Pennsylvania Historical and Museum Commission. 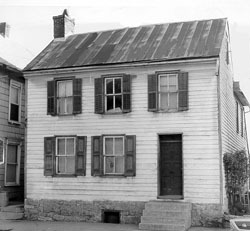 John Brown (1800--1859) occupied an upstairs bedroom in this house in the summer of 1859, while he formulated his plan and secured weapons for his attack on the Federal arsenal at Harper's Ferry on October 16, 1859. Because of his notoriety as an abolitionist and his Kansas escapades, Brown assumed the name of Dr. Isaac Smith and claimed to be scouting the area as an iron mine developer. While in the town, Brown purchased tools from the Lemnos Edge Tool Works and other local businesses and stored them, as well as weapons, at the nearby Oak and Cauffman Warehouse on North Main Street. Brown transported these tools and weapons to his Harpers Ferry attack headquarters, the Kennedy Farm, located in Samples Manor, Maryland. Over his stay in Chambersburg, Brown was visited by several abolitionist leaders such as Frederick Douglass, Shields Green, J. Henry Kagi, and Francis Jackson Meriam. Residents of Chambersburg did not realize that Brown had resided in their midst until after the news of the rebellion at Harpers Ferry was in the newspapers. 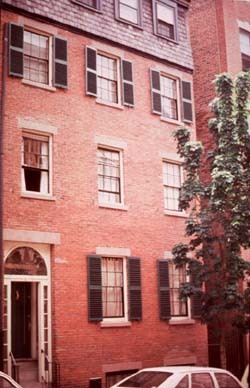 The John Brown House is located at 225 East King Street in Chambersburg, Pennsylvania. It is open to the public.